Blizzard is getting ready to release patch 5.3 to the PTR and so they published some preliminary patch notes. 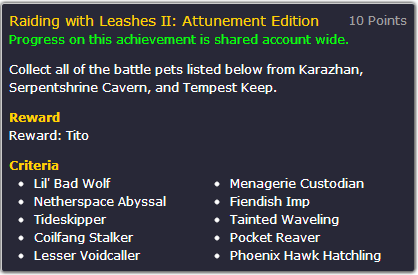 And it looks like we’re getting a new Raiding with Leashes achievement. If you’re not familiar the original Raiding with Leashes sent you into old world raid dungeons to kill bosses and collect the pets that they dropped. Raiding with Leashes 2 does the same thing with the Burning Crusade raids (At least the ones that remain un-upgraded). So we’ll be entering Karashan, Serpentshrine Cavern, and Tempest Keep killing for pets. We don’t know for certain yet which pets drop from which bosses yet. But we can hazard a guess. The achievement rewards you with a pet named Tito which is Dorothee’s dog from the Wizard of Oz Opera Event. I had a lot of fun going after the pets in the original achievement and I’m really looking forward to this one. Speculating on their locations is fun too. Patch 5.3 should hit the PTR soon! UPDATE: (5/1/13) Updated the pets. Now we know the source for all of them.